Sad news for the aviation industry in Marlborough with the biggest employer Safe Air, part of the Air New Zealand group, set to slash up to 100 jobs. Air New Zealand will lay off about 100 jobs at its engineering subsidiary Safe Air in Blenheim due to the indefinite postponement of a major contract to upgrade the Royal New Zealand Air Force C130 transport aircraft. Jetstar have opened their first domestic pay-per-use lounge at Auckland airport. Passengers travelling on Jetstar's domestic network can purchase entry to the Akarana Lounge to enjoy free food and beverages, as well as big-screen entertainment and business facilities including workstation areas, free Wi-Fi access and computer terminals. If booked online the charge is $9.99 a person or $15 for those who pay at the door. Jetstar executive manager commercial David Koczkar said further customer initiatives would be rolled out across the domestic network including high levels of self-service at check-in and the introduction of SMS boarding passes. 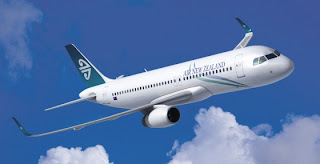 Singapore-based BOC Aviation and Air New Zealand (ANZ) have signed agreements for the long-term lease of two new Airbus A320-200 aircraft. The two A320s will arrive towards the end of 2011 and will be the first of the A320s to replace the current Boeing 737-300 fleet on domestic routes. They will be part of the last four Air New Zealand A320s delivered without Sharklets. They will be registered ZK-OJP, OJQ, OJR, OJS. The remaining 10 A320s on order will be delivered with the new sharklets and will be registered in the ZK-OX? series, and will enter Trans-Tasman and Pacific Island service allowing the current A320 fleet to replace the remaining 733s.